Plextor PX-SP08U is an external portable hard drive with 80 GB storage space and features Shock Proof technology to protect the data from accidental shake or drop. 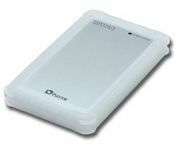 Plextor portable hard disk has USB 2.0 connectivity and comes with a silicon skin to protect the chassis from scratches and a handy carrying pouch. ComputerAct!ve reviewed Plextor PX-SP08U portable hard drive and gave the rating of 4 out of 5, and concluded that the Plextor PX-SP08U offers a very convenient way of transporting up to 80Gb of video, audio or photos. The good points are ruggedised against (reasonable) knocks, very easy to connect and use and deeds no separate power supply, while bad points are not that quick and back-up software would be handy.